1Click the Add New link in the Links Dashboard menu. The Add New Link page opens. 2Type the name of the link in the Name text box. This is the actual name of the site that you’re adding to your link list. 3Type the URL of the link in the Web Address text box. This is the destination you want your visitors to go to when they click the name of the site. Don’t forget to include the http:// part of the web address. 4(Optional) Type a description of the site in the Description text box. Providing a description helps further define the site for your readers. 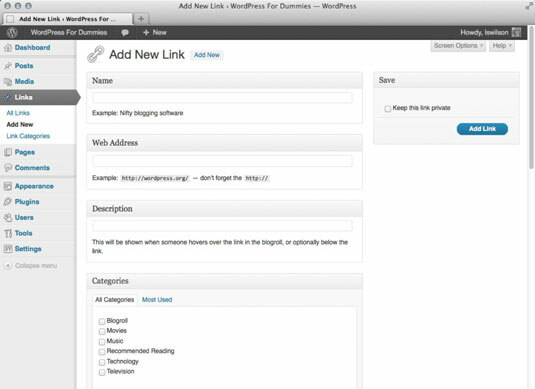 Some WordPress templates are coded to display the link description directly below the link name through the use of a specific WordPress template tag. Assign your new link to a category by selecting the box to the left of the category you’ve chosen in the Categories module. If you don’t select a category for your new link, it’s automatically assigned to the default category. If you find that the Link Category is not an option that you use regularly, you can collapse (close) this module by clicking anywhere in the Categories title bar. You can also move the Categories module on the Add New Link page by dragging and dropping it to a new location. 6(Optional) Select a target for your new link. Select one of the following radio buttons in the Target section: _blank, _top, _none. The third option — None — lets your visitors decide whether they want a bunch of new browser windows opening every time they click a link on your site. You can reposition the Target module by dragging and dropping it to a new location on the Add New Link page. You can also collapse this module. 7Set the Link Relationship (XFN) options (Optional). XFN stands for XHTML Friends Network and allows you to indicate the relationship you have with the people you’re linking to by defining how you know, or are associated with, them. Link Relationship (XFN) is kind of a silly bookmark-type assignment that indicates how well you know the person whose site or blog you’re linking to by defining your relationship with her. 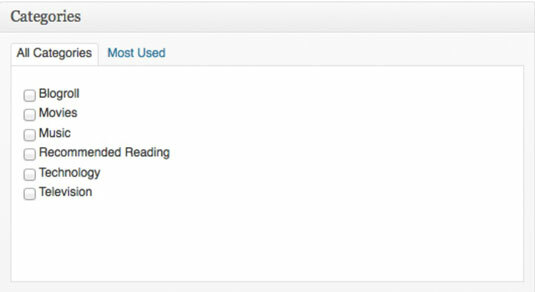 You can reposition the Link Relationship module by dragging and dropping it to a new location on the Add New Link page. You can also collapse (close) this module. 8Set the advanced options for your new link. 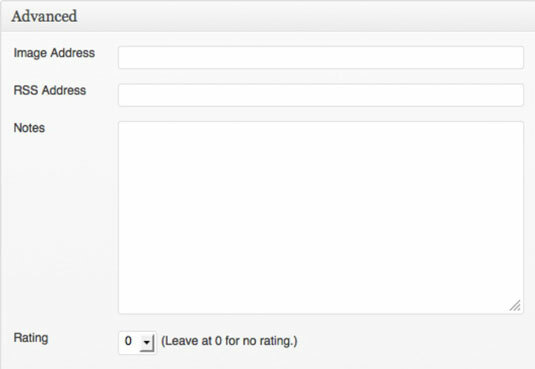 You have four options in the Advanced module: Image Address, RSS Address, Notes, and Rating. You can reposition the Advanced module by dragging and dropping it to a new location on the Add New Link page. You can also collapse (close) this module. 9To save your changes, scroll up to the top of the Add New Links page and click the Add Link button. Choose whether to make the link public or private. To keep the link private, select the Keep This Link Private check box and no one except you can see the link. If you want the link to be publicly displayed on your blog, leave that box deselected. You can reposition the Save module by dragging and dropping it to a new location on the Add New Link page. You can also collapse (close) this module. A blank Add New Links page opens, ready for you to add another new link!